Bother are fabricated with 28nm technology, which means more transistors in the same area compared with the 32nm (for example, Exynos 4 Quad used in Galaxy S3, Galaxy Note 2, Galaxy Note 10.1, and Exynos 5 Dual used in Google Nexus 10) or 45nm ( for example, Exynos 4 Dual used in Galaxy S2, Galaxy Note; Snapdragon S4 Play) technology. For Samsung, it is a big leap because it is it’s first 28nm processor. While Qualcomm have used 28nm technology since last year. Both Snapdragon S4 Plus (for example used in Nokia Lumia 520, 620, 720, BlackBerry Z10, HTC One X, Motorola RAZR HD), and S4 Pro (for example used in LG Optimus Google Nexus 4, , Sony Xperia Z, HTC Butterfly) are using 28nm technology. 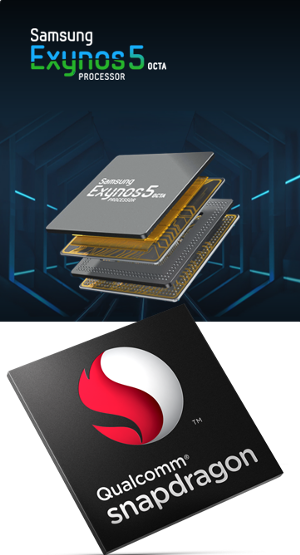 So, it is safe to say both Exynos 5 Octa and Snapdragon 600 are beasts for smartphone and tablet with more than enough power. The major difference is that Qualcomm does heavy customization (Krait 300) but still similar to Cortex-A15; while Exynos like svanilla Cortex-A15 with some tweaks. But performance should be similar. However, Exynos 5 Octa has 4 A15 cores at 1.8GHz for CPU intensive jobs, and another 4 A7 cores at 1.2GHz for less intensive jobs to save power. This may overall improve battery life (at any time either A15 cores or A7 cores are working, not both). Another difference is Qualcomm usually ships modem with processor. But Snapdragon 600 does not include modem!! ( while Snapdragon 200, 400 and 800 has the advantage of integrated modem) This is the major reason why Samsung has no reasons to choose Snapdragon 600 if LTE is a concern. Technically, it is hard to differ Exynos 5 Octa and Snapdragon 600. The rumor that Exynos 5 Octa has heat dissipation issues does not sound reasonable. Thermal management is quite sophisticated nowadays, and it should never be a bottleneck for a chip maker. Also, it is unlikely such a problem was found in last minute. Snapdragon 600 does not include modem!! No advantages over Exynos 5 Octa. Samsung has more than sufficient yielding capacity to fabricate Exynos 5 Octa, because the chip order from Apple is getting smaller and smaller. Samsung is an Asian company. They try deadly hard to use own components, even if it is not the best choice in Westerners’ eyes. We will know the the answer on March 14. Honestly my galaxy s4 m9191v with a qualcomm 1.9 ghz processor gets warm quite a bit, and does infact have throttling, I downloaded a cpu monitoring widget, and most of the time it throttles it down to around 350 mhz when running on the home screen, and when it does a little more intensive apps it goes up to 1.67 ghz, which is about HTC one speeds. I have not really tried to make it go past the 1.6 but to be honest the screen is almost warm all of the time. even when its just in my pocket sitting there with no apps running, if this was winter, that would be okay, but its the summer, and its getting hot. when the screen is off and you are not listening to music (or copying files), the phone should be quite cool. If you feel it is warm and your battery drains quite fast, you may check the causes with CPUSpy and BBS to find out the casues. You may refer to this guide (it is for Galaxy Note, but it works for S4 as well). For the CPU frequency, it usually runs in lower frequency. Actually, most of today’s flagship smartphones are overpowered.